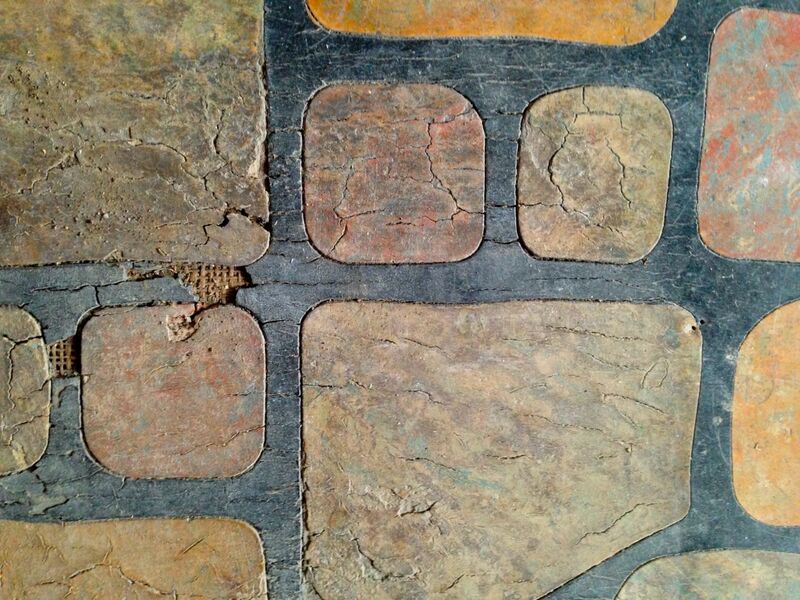 One day I pulled up the 1970s vinyl flooring in the Cross House kitchen. Under was a thin layer of Masonite-type boards. I laboriously pulled all that up. ABOVE: The 1930s linoleum flooring in the kitchen of the Cross House. 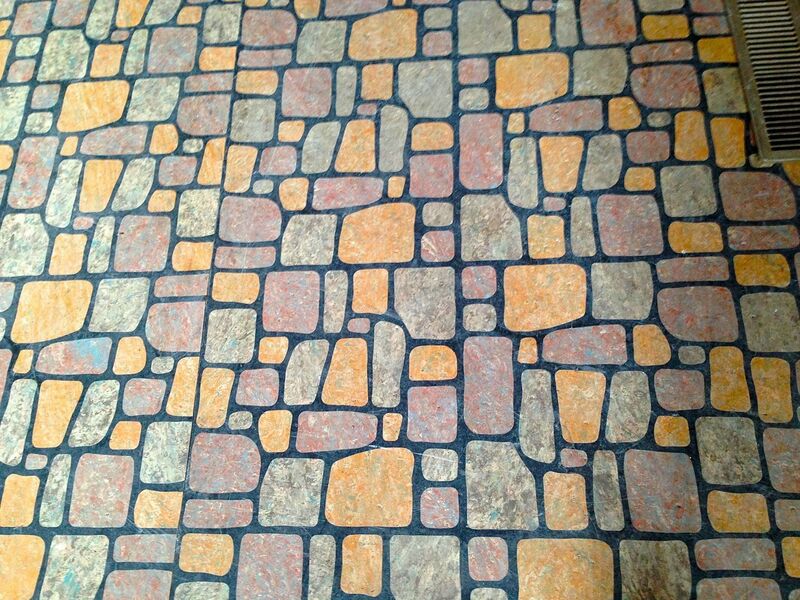 There can be no question: The Cross House has the EXACT same flooring the Flintstone’s have in their home. Right? The flooring is so crazy! Even more amazing than its appearance is its construction. With modern flooring, the colors would simply be laid upon a plain sheet of vinyl. With time, one would wear through the coloring. But the Flintstone flooring is solid color all the way through. To do this, each and every color you see above is a separate piece from the adjacent color. I repeat: a separate piece. ABOVE: See what I mean about each piece being separate? I cannot fathom how they did this in the 1930s. Today, such flooring could be created by computer lasers. But in the 1930s? Were legions of munchkins kept locked in vast warehouses and forced to laboriously snip snip snip zillions of these pieces? The flooring stuns me. It is both beautiful and very odd (a combo I, for some reason, always find appealing). Sadly though, while in amazing shape for its age, I cannot keep it; too many areas are damaged. And under is the original pine flooring. I would love to restore that. The plan is to carefully pull up the Flintstone flooring, and use it to make counter tops for the kitchen, and as a surface for the huge table in the laundry room (below the kitchen). This way the flooring will remain in the Cross House, where it has been for 80+ years, but be repurposed. I think Fred & Wilma would approve. Can you put up an example of all the different floorings you removed. It would be interesting to compare the different decades. I removed the other flooring before I had this blog. So I did not take images! The 1970s floor was plain white. The 1950s floor was plain off-white with gold flecks. Neither was of interest. But what was under? Zounds! You should have seen my face when the 1930s floor first peeked out from its imprisonment! Are you going to cover this with something on the countertops? I did not quite understand your question. of the linoleum if you used it as a table cover..
Ross, I have been reading your comments on “Old house dreams”, for years now. I have never posted any comments on the site, but I am truely in LOVE with it. I have spent the last couple days reading your blog. My husband said last night, “are you still looking at that house?” We live about 3 hours from you and Tom (husband) went to a year if college in Emporia in the early 80’s. I asked him if he remembered the Cross Home. He said he wasn’t sure as Emporia had so many large Victorian homes. ~ I believe the floor you are talking about on this page was probably “cut” with a die and then assembled. ?? Keep up the good work! Check out Wikipedia on linoleum. Yes they are separate pieces (talk about the world’s worst jobs) and linoleum is still made and used in high traffic areas as it is more durable than vinyl and more flexible than tile. I’m fairly sure they used metal moulds or something like that for the soft raw materials rather than cutting the individual pieces. The undamaged sections have no space for a mould between the different colors. And it is certain that the various colors ARE separate pieces, as shown in the images. Or do you mean that each piece was MOLDED rather than CUT, and then all pieced together like a jigsaw puzzle? If so, yes, that certainly makes sense! Pleaseeeeeeeeee do not use this flooring for the kitchen countertops!!!! Are you sure this doesn’t have asbestos in it? Before you use as a counter top? …..3 years too late I know.